Why is it important to understand the history of the Roman Catholic church in Ireland? The Roman Catholic Church in Ireland has had a long and at times turbulent history that has greatly affected both the creation and survival of its records that you need to help you trace your family history in this faith. I recommend reading the chapter on Irish Catholic records by James Ryan in the book he has edited on "Irish Church Records" (see my Guides & Finding Aids Bookshelf) as this explains not just the religious history of the times but more importantly, the consequences of this history for genealogists today. I'll attempt a brief summary on this page to give some context to what I have learned on my quests. Prior to the rise of the Protestant faith in the form of the Church of Ireland in the 16th century, Ireland's population was overwhelmingly Roman Catholic, especially those on the lower rungs of society and from whom perhaps the vast majority of us searching for our Irish Ancestry may descend from. However, persecution of this majority, both religiously and legally took many punitive forms over the last 400 years - suppressing worship, attempting to cut-off the supply of both priests and funds, prohibiting owning valuable assets under the Penal Laws and barring any political representation. Therefore, it is not surprising that the genealogical foundations of family history research in the form of parish registers of baptisms, marriages and burials either never existed (due to fear of discovery in dangerous times or because impoverished priests had neither the skills or resources to keep them) or have been lost in the intervening years as the church struggled to keep its organisation intact in the face of an increasingly Protestant dominated ruling class. Having said that, don't despair - there are many parish registers that have survived and recent initiatives on-line have made these freely available to everyone (see below.) Also, don't forget that you may find mentions of your Roman Catholic ancestors in many other places, particularly records of state e.g. probate calendars, registered deeds, land valuation records etc. You may also find surviving Poor Law Records to be a good hunting ground for Roman Catholic kin. One unusual resource that has recently (Sep 2016) been released for free online by the National Archives of Ireland details the 18th century Catholics who felt it prudent in the light of the suppression of their religious and civil rights to renounce their faith and swear allegiance to the King and the Protestant church. See Catholic Qualification and Convert Rolls (1700-1845) for more details. However, don't be surprised if you find later descendants of some of the people named in here reverting back to their original faith when the Penal Laws were relaxed. How was the Roman Catholic church organised geographically? There were originally 4 Roman Catholic Archdioceses, each sub-divided into Dioceses as follows, which are virtually the same as the Church of Ireland diocesan divisions (not surprising as the Protestant church decided it was both politic and logical to re-use the existing divisions.) This list may not represent the shape of the modern Irish RC church but is as good a starting place as any to talk about the historical organisation of potentially surviving records. Which diocese and / or parish is relevant to your research? The first place to start is to establish which Roman Catholic (RC) parish covered the townland your ancestor lived in. RC parishes were often much larger than their CoI counterparts and were not always constrained by county boundaries either. The Irish Ancestors Roman Catholic Records page starts off with the Irish counties maps by county - click on any county to be shown the RC parishes in the county. Click on any parish and you can find out what records survive and where to access them. John Grenham's book "Tracing your Irish Ancestors" (see my Bookshelf) also has a huge final chapter that gives this information by county too, as well as indicating which RC Diocese each parish fell under - I wonder why this information didn't make it on to the website? The Catholic Directory of 1848 has a map of the Archdioceses and Dioceses of the time and can be explored by clicking on any of their names to find out which parishes they contain and also where the actual churches were on a map. There is also a lot of what I would call contiguous information i.e. neighbouring RC parishes and linked civil parishes, which should also be borne in mind when extending your search. If you know the name of the town that your RC ancestors came from, try the Town - RC Parish search facility to help you identify the name of its RC parish. Make a note of surrounding parishes too as although your ancestors may have told the immigration official they were from Wicklow for simplicity, they might actually have hailed from further afield in the county. If you don't have an exact place name to go on, but know a county or general area, try the Catholic Parish and Church Search by Location screens. Remember, most people would have had to walk to church so it can be useful to look at where the churches were and think about how far people might have come from practically to reach them. ​Brian Mitchell's "A New Genealogical Atlas of Ireland" (see Guides and Finding Aids Bookshelf) has maps of the Roman Catholic parishes indicating which RC diocese they fell within too, but this information is given as very simplistic line drawings that give a general idea of the size, shape and location of the parishes but not in relation to any major towns or any other geographical features. 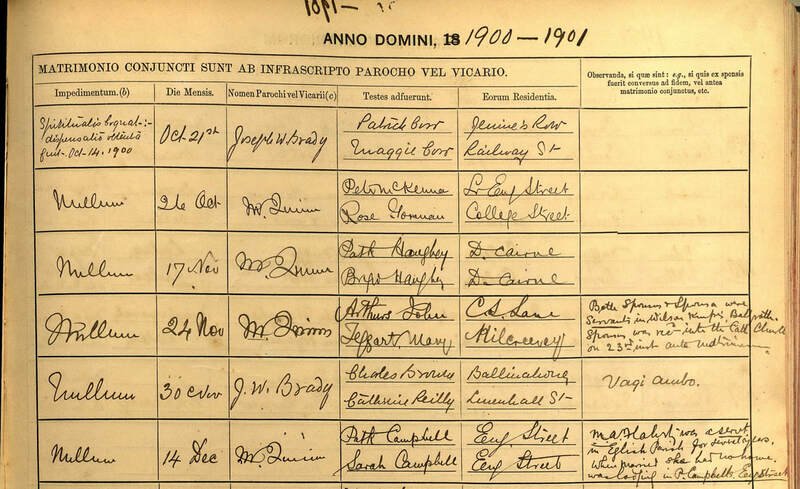 What parish records survive and where can you find them? Unfortunately, according to James Ryan, there are virtually no Roman Catholic records that pre-date the late 17th century. Later records are more likely to be found in towns and urban areas rather than their rural hinterlands. Regionally, Leinster and Munster have many more surviving registers than Connaught and especially Ulster, the latter having been subject to large scale Scottish Protestant plantation hell-bent on suppressing what they saw as "papist rebellion". ... The National Library of Ireland's Catholic Registers website. This was launched in Summer 2015 to great acclaim and is a brilliant step forward in Irish family history research. The image to the left is a searchable map of RC dioceses on the website, which does differ very slightly from the historical lists I've detailed above but is close enough. These digitised images of surviving RC parish registers mostly go up to the 1880's and previously were only available to the intrepid family historians prepared to wrestle with dusty microfilms in a gloomy little side room off the stairs in the Kildare St. building. Although there is no accompanying index on the NLI website - you will have to browse by parish - this should not necessarily be looked upon as a burden as you may find other relations whom you never thought to search for, plus get a really good idea of the main Catholic families in the vicinity and how they may have inter-married. However, if you are a bit daunted by having to plough through a large register, you could use any transcripts that might appear for the parish on the relevant RootsIreland (£) county page, but as always check the source pages carefully first to see what coverage they actually have - some counties have very little. ​What can you expect to find in the records? Firstly, you might need to brush up on your school-days Latin, as some parish priests used this in their registers (see my Kindred Ancestry blog story for more advice on dealing with Latin.) Early registers are very free-form and the entries can be very brief. Later registers may make use of pre-printed pages which makes it a little easier to understand what's been recorded. For pre-printed registers, be sure to look at BOTH pages the record spans across or you will miss vital information. Baptisms will usually give the names of the child and the parents (often with the added bonus of the mother's maiden name) plus up to 2 godparents or sponsors (often abbreviated to SS) who will often be extended family members. You may also learn the date of birth in addition to the date of baptism. Early marriages may be very brief and simply state the date and the names of the couple, perhaps with some witnesses. Later marriages on the pre-printed pages seem to contain father's names and addresses and the names and addresses of witnesses. For both baptisms and marriages, make sure you check the comments box on the far-right of the printed forms as this may contain invaluable information. Baptisms may have been revisited many years later when the grown-up child wished to marry and the baptism had to be verified, so you may find precious details of a marriage noted here. Given the high rate of emigration too, this marriage may have taken place overseas with the local priest applied to from abroad to provide verification by return of post, so this may be a crucial piece of solving that people puzzle where someone disappears on you! Comments on marriage records can be equally enlightening as the example below shows. In addition to the occasional Latin phrases, mercifully, fuller biographical information may appear in English explaining the circumstances of the marriage as shown here i.e. occupations, adult baptisms of non-RC spouses, residential status etc. Burials seem to be much rarer with the most basic information recorded - the Roman Catholic church does not consider burial to be a sacrament. Although there are some separate RC cemeteries and RC churches and chapels with their own graveyards, it's always worth checking the burial registers for large urban cemeteries or even CoI churches for RC burials too. Where can I get some good advice on Roman Catholic records? I found 2 good talks online that have some excellent advice to listen to. The IGRS Guide to Roman Catholic Records by Claire Bradley is an excellent step by step guide to the records but you will need to be a member of the Society in order to view it (Scroll down the page to the 3rd video). Brian Donovan gave a talk at Rootstech 2018 on Unlocking Roman Catholic Records, which although there is an emphasis on how American researchers should approach the records, it still contains some very good advice and thought provoking comment. I was particularly interested in the advice on Ne Temere - the decree issued by the Catholic Church in 1907 which essentially led to a tightening of the rules on marriage of the faithful. One of the genealogical benefits of this decree was that persons wishing to marry somewhere other than their baptismal parish would have had to apply for proof of the said baptism and so you may find their baptismal entry annotated with their later marriage in perhaps England or the US.